In February, Greece agreed to a four month extension of its current bailout programme, subject to the approval of reform measures proposed by the Greek government. As yet, however, the country’s creditors have still not reached an agreement over the reforms which have been put forward. Tough negotiations ahead, the piecemeal approach which has so far been adopted by Eurozone governments during the crisis is becoming increasingly unsustainable. The recent negotiations and the agreement to extend the Master Financial Assistance Facility Agreement between Greece and its institutional creditors (the IMF, ECB and Eurozone) highlight a range of issues pertaining to European monetary, fiscal, and political integration. This two-level negotiation between a weak debtor country on the verge of default and a heterogeneous coalition of creditors may well prove to be of utmost political significance. The diversity of national positions on the issue of Greece within the Eurogroup – with France and Italy taking a softer position vis-à-vis Greece as opposed to Germany, Spain, Portugal, and the Northern bloc – and the multiplicity of overlapping transnational cleavages affected by its potential redistributional effects demonstrate the issue’s political complexity. Some observers have likened the recent bailout negotiations to a game of ‘chicken’ with uncertain ‘collision’ payoffs. The original two bailouts in 2010 and 2012 were mostly driven by fears of financial contagion in the event of a ‘Grexit’, which were eventually allayed through the establishment of the European Stability Mechanism, the activist monetary policies of the ECB (especially through the OMT and QE programmes), and the launch of the banking union. 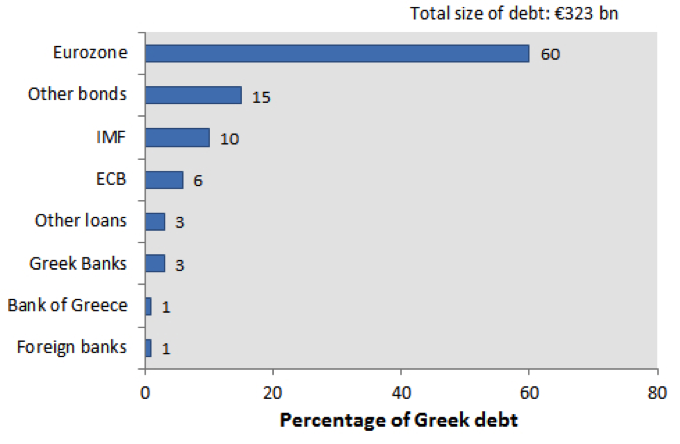 What was markedly different this time round was the fact that, following the sovereign bond restructuring in February 2012 (with private sector involvement), the bulk of Greek external debt now rests in the hands of the official sector (see Figure 1), which is answerable to foreign electorates, taxpayers, sovereign bondholders, and non-European IMF member states. As a result, the political contours of the relationship between Greece and its creditors have been significantly altered. Political contagion has become the new name of the game, both in terms of, first, signaling commitment to the irreversibility of EMU to global investors; second, inducing fiscally prudent behavior by EMU incumbents (especially those not under an official bailout programme) in accordance with the Fiscal Compact (moral hazard); and third, helping the electoral prospects of mainstream pro-European parties (adverse selection) by signaling resolve to enforce the existing policy framework. The nature of the agreement would set a precedent on the renegotiability of Eurozone rules in the aftermath of national elections and partisan shifts in the make-up of national governments. Whichever way the pendulum swung, strong signals would be sent to multiple recipients (governments, parties, voters, taxpayers, and investors). The hard-powered incentives of monetary bailout and the leverage enjoyed by creditors over a heavily indebted nation have rendered Greece the guinea pig of austerity policies. Continued adherence to such a policy prescription in the face of limited signs of economic recovery is a warning to others who may wish to tamper with the fiscal rules of EMU (e.g. France and Italy). In the end, a delicate balance was struck between respect for national democracy and adherence to common rules, considerations of moral hazard and the humanitarian effects of austerity, containment of political contagion and apprehension of the domino effects of a potential ‘Grexit’. Although in principle the extension agreement was seen as a reaffirmation of the loan-for-reforms conditionality arrangement reflecting the interests of creditor nations and institutions as well as pro-austerity governments such as Spain and Portugal, the intentionally vague phraseology of the joint statement constituted a significant concession to the new Syriza government, not least because of its omission of the politically toxic terms of ‘Troika’ and ‘Memorandum’. Greek Finance Minister Yanis Varoufakis used the phrase ‘creative ambiguity’ to characterise the spirit of the renegotiated contractual arrangement. On the one hand, the wording provides a strong enough recapitulation of the terms of the relationship between Greece and its creditors so as to be acceptable to both national parliaments and public opinion. Moreover, with Greece's commitment to abstain from any unilateral actions with significant budgetary costs, creditor institutions (formerly known as the 'Troika') have reasserted themselves as effective veto players or 'censors' in the domestic policy formation process. On the other hand, the Greek government won some time, discretion, and flexibility in its design and implementation of a socially fair and fiscally balanced adjustment to economic growth and sustainability (outlined in the recent gradually unveiled ‘Varoufakis’ list of reforms). Greece is thus becoming the ‘co-author’ of its own reform strategy. The key question remains how well it can 'sell' it to both domestic and international audiences. In its pursuit of this new package of reforms, the new Greek government – while still enjoying a high level of political capital and a strong anti-austerity mandate – will have to walk the tight rope of gaining international credibility in the eyes of foreign creditors and investors without losing popular and partisan support. And yet, the loan extension agreement in February constituted only one salvo in the battle against the Greek debt crisis. It effectively set the stage for an upcoming round of negotiations between Greece and its creditors with respect to debt restructuring and potentially a new bailout. Continued economic and political uncertainty, anaemic growth, and deflationary pressures in Greece may render its euro membership increasingly untenable in the near future. Despite efforts to ‘quarantine’ the Greek ‘patient’ and to present it as an exceptional case, the ongoing strategy of 'muddling through' the rough waters of a debt crisis may soon have to give way to a watershed decision tipping the scales towards less austerity and more fiscal centralisation. In the face of deteriorating economic prospects for Greece and urgent liquidity needs, any decision aiming at keeping the Eurozone intact will have to be more radical than what has been seen so far. It has been a recurring theme of international monetary regimes that, when there is conflict between internal adjustment and external adjustment objectives and no recourse to fiscal or monetary stabilisers, such a regime comes under intense pressure to either disintegrate or transform itself into a fiscal union. Thus, the political spillover effects of a new deal with Greece will be unavoidable, either in terms of paving the way for more fiscal coordination and centralisation under a more flexible regime, or marking the beginning of the end of EMU. In other words, these current squabbles may either amount to the 'growing pains' or the ‘dying throes’ of an 'ever closer union'. What is for sure is that the incrementalist approach adopted so far is becoming increasingly unsustainable. Nikitas Konstantinidis is a University Lecturer in International Political Economy at the University of Cambridge. The paper was first published here.